Our recording studio windows and recording studio doors concentrate on reducing the low-frequency sounds, which is typically the area where you need the most help. 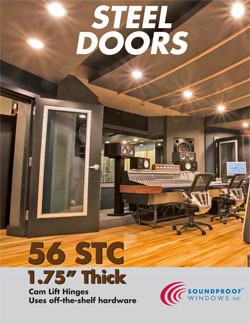 These new recording studio windows and recording studio doors have lab tested STCs in the 60s, which will match or exceed your wall STCs. With Soundproof Windows, you can easily achieve window STCs from 48 to 57 (minimum). Keep the same outside appearance for all of the windows on a project. Add Soundproof Windows only behind those windows that need soundproofing. These are perfect for DIY recording studios, home studios, and more can be added after project completion if needed. Rather than modifying some other window design, we designed our Soundproof Windows from the ground up to maximize noise reduction. Extensive testing and retesting perfected our design, resulting in these superior STC results. The added benefits were air infiltration reduction and improved insulation values. Plus, Soundproof Windows offer 99% UV Blockage. Low-e glass typically blocks less than 71% of UV radiation. Soundproof Windows use laminated glass which blocks 99% of UV radiation. We have been working on our soundproofing technologies for decades. Our passion came from our own noise issues at our homes, coupled with our love for music and recording. We offer many flexible solutions to solve noise problems. Our low profile secondary windows are designed to stop the noise and air infiltration and improve the insulation values of the primary windows. Energy savings will pay for these windows quickly. Our windows are fully operable, available nationwide, and come in many configurations, for both residential projects such as living room and bedroom noise, or recording studios, professional or home. There is no need to replace the existing windows or change your designs to use a different primary window. You can simultaneously soundproof and add insulation with Soundproof Windows. Click here to examine detailed engineering drawings.